The images are showing a prototype, changes are reserved. First come, first served. Supply only as long while stocks last. The 8C 2900B Special Touring Coupé was “made to order,” and it is now the pride of the Alfa Romeo museum “Storico” in Arese, Italy. Not only does the vehicle have an interesting history, but it also fea-tures a spectacular styling of coachwork and unique looks. 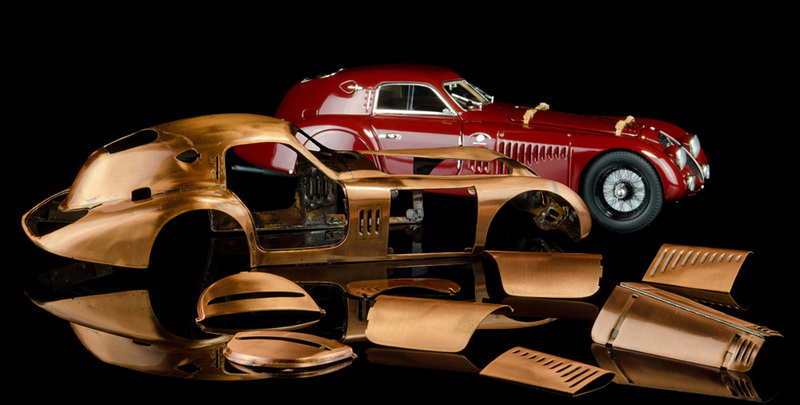 This is reason enough for us to pick this ex-traordinary car for a small limited edition of 300 pieces in scale 1:12 to be distributed worldwide. Originally the 8C 2900B was built for the 24-hour race of Le Mans in 1938. It was fitted with a closed body (Berlinetta), designed by Touring specialists based on their expertise in aerodynamics and light-weight construction — a patent technology known as Superleggera (aluminium body). An 8-cylinder in-line engine empowered by an output of 220 hp, together with the necessary accessories, made the car fully equipped for Le Mans overnight racing. Despite its overwhelmingly superior lead during the race, the 8C was not able to finish. A tire blowout and a subsequent ruptured valve put an end to its chase of a seemingly certain victory. Nevertheless, there is no denying that the Alfa Romeo 8C 2900 was fitted with “a highly-advanced chassis and running gear with features that were absolutely revolutionary for the era” and that “the Touring bodies on the 2.9 Alfa were clearly the most advanced automobile bodies of their time” (Malcomb Harris in The Immor-tal 2.9 by Simon Moore).